In the May 7 issue of Optics Express, scientists from the National Institute of Standards and Technology (NIST) reported the development of a tiny prototype device that could replace table-top-sized instruments used for laser calibration in atomic physics research, could better stabilize optical telecommunications channels, and perhaps could replace and improve on the precision of instrumentation used to measure length, chemicals or atmospheric gases. This new spectrometer is the latest in a NIST series of miniaturized optical instruments such as chip-scale atomic clocks and magnetometers. 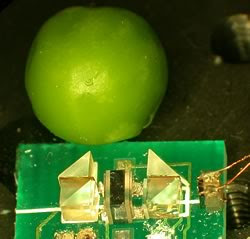 The spectrometer is about the size of a green pea and consists of miniature optics, a microfabricated container for atoms in a gas, heaters and a photodetector, all within a cube about 10 millimeters on a side. The key to the device is a tiny glass-and-silicon container that holds a small sample of atoms. The sample chambers were micromachined in a clean room and filled and sealed inside a vacuum to ensure the purity of the atomic gas, but they can be mass-produced from silicon wafers into much smaller sizes, requiring less power and potentially cheaper than the traditional blown-glass containers used in laboratories. Although shrinking container size creates some limitations, NIST scientists have accommodated these difficulties by adding special features, such as heaters to keep more atoms in the gas state. The package could be used to calibrate laser instruments, or, if a miniature laser were included in the device, could serve as a wavelength or frequency reference. NIST tests predict that the stability and signal performance of the tiny, portable device can be comparable to standard table-top setups. The mini-spectrometer would offer greater precision than the physical references now used to separate fiber-optic channels, with the advantage that more channels might be packed into the same spectrum. "Microfabricated saturated absorption laser spectrometer"